Occupying a very prime Upper East Side location, this 18-story apartment building was one of the first new apartment buildings erected on Park Avenue after World War II. The building, designed by Emery Roth & Sons, opened in 1948 and was converted to a condominium in 1984. 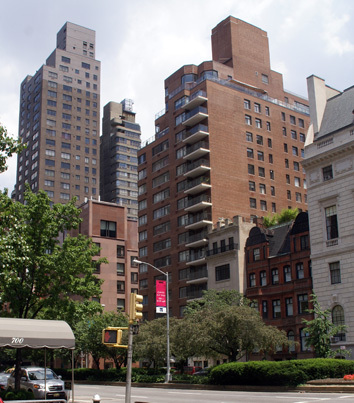 The 77-unit building is across 70th Street from the Asia Society and many critics have cited the cross-street as one of the most impressive in the city as some of the townhouses have belonged to some of the world's wealthiest people. The attractive doorman, red-brick building has balconies at its southwest corner and because it is just to the north of some low-rise buildings on the avenue they have better views than most of the typical mid-rise Park Avenue buildings. The building's northwest corner has corner windows and the building has some terraces at its top. The Union Club and Hunter College are nearby to the south and a local subway station is at 67th Street and Lexington Avenue and a police precinct is also very close. Cross-town buses run on 67th and 72nd Streets and some of the city's best private schools, art institutions and galleries, boutiques and clubs are in the vicinity. The neighborhood ambiance is as good as it gets in the city. The building has a one-story marble base and a canopied entrance with a doorman. It has a two-step-down lobby with a lovely black-and-white marble floor and nice wood-paneled elevators.